Three packs of coloured playing cards (1 Daler Rowney oil paint colours, 2 le Coubusier - intellectual colours, 3 Basic web colours) made as packs with coloured sides. Each repeated four times to make large piles. A square black MDF subwoofer active speaker with no treble spaekers playing a cover version of the song 'Somebody got to die' by Biggie Smalls, covered by 'Die Kunst' re-titled 'Certain Death'. 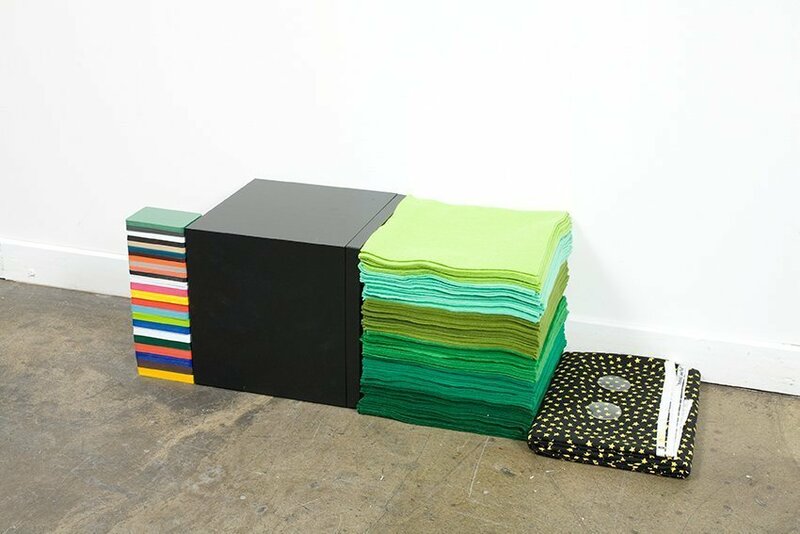 Felt squares in an array of different shades of green, piled next to and cut to the same size as the subwoofer speaker. A folded piece of cotton with small yellow stars on a black background, on top of which sit two round glass lenses from the spectacles of Harry Potter. The four stacks are piled in a row.